Brussels (12 July) – Minister of Finance Peter Kažimír chaired the first Economic and Financial Affairs Council (ECOFIN) under the Slovak Presidency in Brussels. The Council found that Portugal and Spain had not taken effective action in response to its recommendations on measures to correct their excessive deficits. It confirmed that they will not reduce their deficits below 3% of GDP, the EU's reference value for government deficits, by the recommended deadline. And it found the fiscal effort made by the two countries to fall significantly short of what was recommended. The Council's decisions will trigger sanctions under article 126(8) of the Treaty on the Functioning of the European Union. The Commission has 20 days to recommend and the Council will have 10 days to approve the fines. 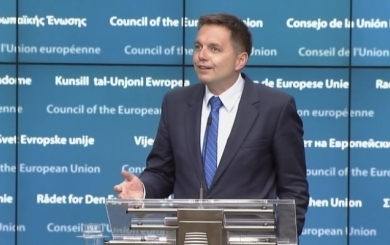 "I am sure that we will have a smart, intelligent result in the end," said Peter Kažimír, minister for finance of Slovakia and president of the Council. The Council adopted new rules addressing corporate tax avoidance practices, following an agreement reached on 21 June 2016. The directive builds on 2015 OECD recommendations with regard to tax base erosion and profit shifting. It addresses situations where corporate groups take advantage of disparities between national tax systems in order to reduce their tax liability. The Council discussed possible further measures to enhance tax transparency and prevent tax abuse, on the basis of a communication from the Commission. "The presidency plans to make progress on action to fight tax evasion and tax avoidance in the coming months." "The presidency plans to make progress on action to fight tax evasion and tax avoidance in the coming months," Mr Kažimír said. "Needless to say, tens and hundreds of millions of euros lost to tax fraud or avoidance could be invested into our economies, and we need to tackle this disease by all means." The Council also discussed a proposal to strengthen EU rules aimed at preventing money laundering and terrorist financing. The proposal is a central element of the EU's response to recent terrorist attacks in Europe, as well as the April 2016 Panama Papers revelations. Technical work will start in July 2016, with a view to enabling a Council agreement within months. The Council discussed the Slovak presidency work programme. "We want to increase the EU's resilience with regard to external and internal challenges and restore the confidence of our citizens in the European project," Mr Kažimír said. the EU's general budget for 2017.